If you have a petrol vehicle, there was good news for you as you had a Rs 3 price cut effetive yesterday but in case you travel by autos and taxi's in capital region of India, you need to worry a bit. The fares of Autos and Taxi's have been increased now. This came into effect as since last 36 months, there has been 40% increase in CNG fuel prices. The new fares will come into effect from tomorrow. 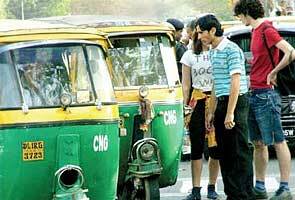 According to the delhi government, the Autos will charge now Rs 25 for first two Kms of travel. Earlier the price was Rs 20. For every subsequent km travelled, the traveller will have to pay Rs 8 instead of Rs 6.5 earlier. Waiting charges will however remain the same at Rs 30 per hour. For Taxi's too, there has been an increase in fare. Those choosing taxis for their travel will have to pay Rs 25 for the first kilometre as against the existing Rs 20. The charges for every subsequent kilometre will be Rs 14 for non-AC taxis and Rs 16 for AC taxis. Previously, one had to pay Rs 11 for non-AC and Rs 13 for AC ones. The last revision in fares of Autos and Taxi was done in June 2010.